The Piaggio Mp3 range has won the first ever "Scooter Of The Year" competition run by our partner publication Scooter Magazine. Piaggio’s Mal Jarrett said “The MP3 provides unparalleled road grip and stability levels, and being available in 250cc and 400cc engines, the MP3 offers power, performance and an ease of use that makes for a thoroughly entertaining ride. The MP3 is a scooter that you just have to experience to be able to appreciate. It’s very satisfying to see the MP3 receive the recognition that we feel it justly deserves”. 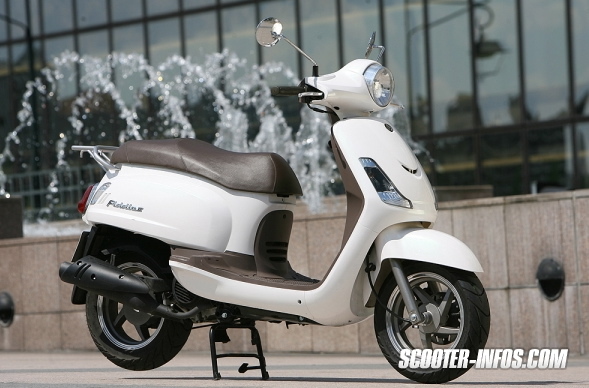 Chosen from a field of scooters including the top selling SYM VS125 as well as the recently released Vespa GTS 300i.e. Super, the Mp3 range from Piaggio came out on top for it's handling, safety and design. To see the full story on this and much much more check out your local newsagent and pick yourself up a copy of Scooter 21. NSW parking laws are changing from 1 December 2008. To bring our system into line with the Australian Road Rules, all ‘No Standing’ zones are being removed. ‘No Standing’ zones will become ‘No Stopping’ zones. This means that even in instances where the sign has not yet been changed, the rules for ‘No Stopping’ apply and a $189 fine will be incurred for any violation. If, however, you stop in a 'No Stopping' zone that is in an operating school zone the fine is $243 and 2 demerit points. ‘No Parking’ and ‘Loading Zone’ rules remain unchanged. 'No Stopping' = You may not stop your vehicle for any reason. 'No Parking' = You may not stop for longer than 2 minutes and only to drop off or pick up passengers or goods (i.e. you must remain within 3 metres of your vehicle). New Sportcity 300 Cube now available at your local Aprilia stockiest with a recommended retail of $7990 + ORC. Aprilia have entered the 300 cc arena with it's all new and revised Sportcity Cube 300. With the all new Piaggio sourced Quasar motor the Sportcity 300 Cube gains a host of revised features from styling through to its dual analogue/digital dashboard. All the key Sportcity features remain like the flat floor, triple disc brakes and 15 inch alloy wheels. The 300 cc category is now becoming hotly contested with the Vespa GTS 300 Super ($8990) as well as the new Citycom 300i($6990) from SYM all offering the ability to cover various distances fast. 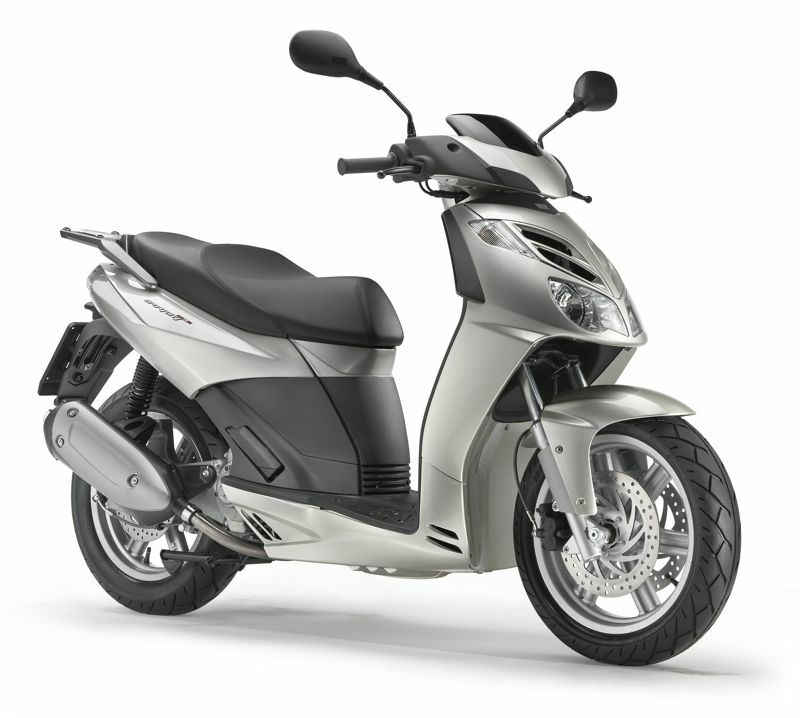 Download the brochures below for more information and detail on the Aprilia Sportcity Cube 300. 105 registered participants converged at Boreen Point on the Sunshine Coast for a weekend that was filled with like minded scooter riders ready to have some fun. Scooteroo held their 2nd Annual Boreen Point Scooter Rally on the 15th and 16th of November, 2008. In 2007, the first year that Scooteroo ran this overnight event they had great response with 60 people riding 50 scooters. In 2008, Scooteroo saw those numbers swell to 105 people riding 85 scooters. People love the location of the rally with Boreen Point located approx 20km's north of Noosa. It makes for an easy and interesting ride from Brisbane with any number of coastal and hinterland routes to choose from. The rally is focused around one of Australia’s oldest pubs, the Apollonian Hotel. The Apollonian Hotel is famous for its laidback atmosphere and their wonderful spit roasts, they also love scooters. The Scooteroo Boreen Point Rally is a short rally by most standards; being for only 1 night. This appeals to a larger number of people who can’t take a longer amount of time off work. Also being later in the year, time is tight for a lot of people so close to Christmas. This rally is also open to any form of scooter, from 50cc’s to big capacity modern autos to the restored classics from Vespa and Lambretta. Everyone is welcome and there is always something for everyone. Scooteroo would like to thank all the sponsors for without their support this event would not have been possible. Vespa and Piaggio Australia gave away shirts to each and every attendee of this event as well as sponsoring 4 major prizes which included loans of the new Vespa GTS300 and Piaggio MP3’s. Scootersales.com.au have also been instrumental in their support of this event by spreading the word throughout the scooter community. On the Saturday night, prizes were given away for various categories from “Most Stylish Scooter” to the “Karaoke Superstar Challenge”. Thanks to the sponsors of these prizes: Corazzo Australia, Scooter Style – Noosa, Scooterlife, Scootopia, Scooters Scooters, The Scoota Sketcha, Retro Scooters, Revolution Scooters and Suncorp Insurance who all donated their products to make the prize giveaways possible. 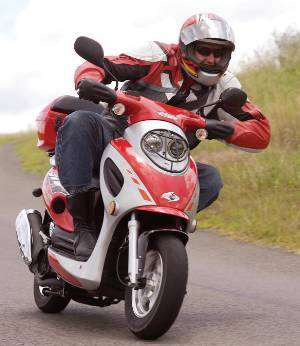 With such positive feedback about the 2008 Rally, Scooteroo is already looking forward to the Boreen Point Rally 2009, planning to go bigger and better, making it the largest Scooter Rally in Australia. 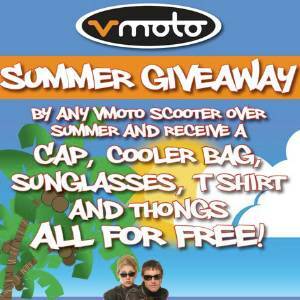 Stay cool this summer with Vmoto scooters free give-away with all model purchases throughout December and January, while stocks last. 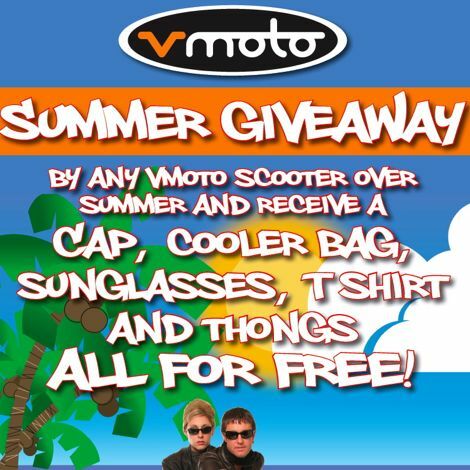 The summer give-away includes a free Vmoto cooler bag, t-shirt, cap, thongs, sunglasses and key ring - all the accessories needed to be part of the Vmoto scene. See your local Vmoto dealer for details and take advantage of the affordable summer pricing including the 50cc Monza from $1890 or the 50cc Milan from $1990 plus on road costs. All Vmoto scooters come with a factory backed 12 month warranty and dealership support for after sales service on maintenance and accessories. See www.ridevmoto.com to select a model of choice, or drop into a dealership and find out about the free summer give-away. As popularity grows in the scooter market, Vmoto Scooters has launched a new retail focused website www.ridevmoto.com allowing customers to cut through confusion, and find a scooter to suit their needs without being bogged down in clutter. 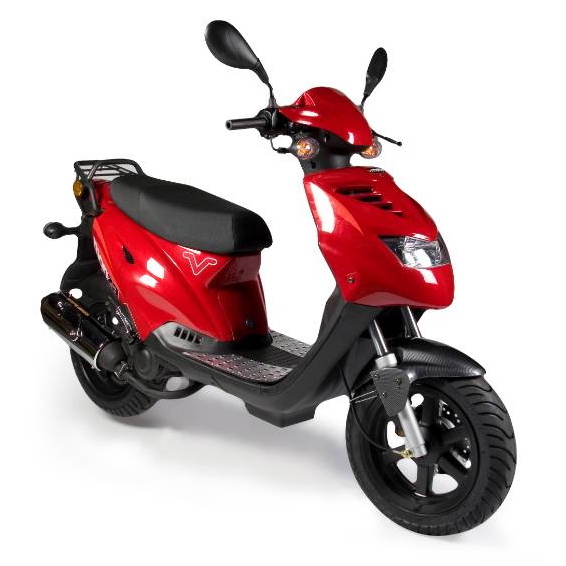 All Vmoto scooter models are featured on the website from the 50cc Monza from $1890 to the 150cc Monte Carlo from $2990 plus on road costs. The site also features an option to book a test ride through a dealership. As an added bonus, when selecting a Vmoto scooter in the range section of the site, customers can visualise their preferred colour through the available colours paint selection. The range section also provides detailed stats and facts for each model, covering everything from engine size and fuel capacity to scooter weight and number of passengers possible. Check out www.ridevmoto.com and book a demo today. The futures looking bright for SYM with a number of things on the go for 2009. SYM have put together a pretty exciting future model line up for 2009. At the recent Eicma Motorcycle and Scooter Show we saw a small piece of what we can expect in the future from one of the leading Taiwanese Scooter Manufacturers SYM. A new version of what we call the Firenze in Australia but known as the JoyMax overseas has been given a styling revamp and injected with the 278cc motor shared in another exciting model the CityCom 300 i. The current Firenze 250 has been a popular scooter in Australia for both its performance versus value and this will look set to continue if we do see the scooter land here. Sources suggest a possible landing sometime towards the back half of 2009. Next up the Joyride which is an update of the stalwart that we know as the Le grande in Australia. A full redesign and an injected 125 cc model finds itself overseas. Its not yet known if we will see this model here in Australia. 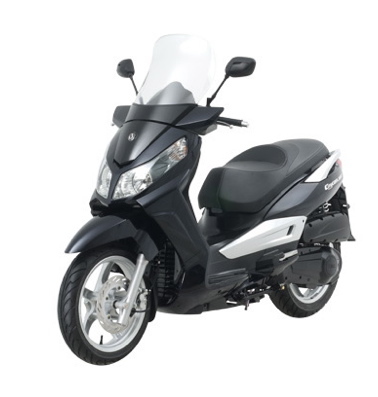 Another exciting overseas model is the SYM Symphony 125. A large wheeled budget scooter that will surely fit into the model range with ease. This is a great opportunity for SYM to appeal to the big wheeled scooter segment especially in countries like Italy. Again not sure if we will see it but if we do it would be welcomed and you just have to love what they did with the name. Things we do know about though are the arrival of the SYM Citycom 300i which will land this month in retail shops across Australia. This model has been a hit with the overseas press praising the performance / value equation which this scooter possesses. At $6990 + orc it certainly should be a serious commuting/touring contender. Also the eminent arrival of the SYM Classic 125 and 50 cc models which should find themselves an instant hit on our market. Due in February the 125 should be priced very competitively around the $3000 mark. Reputable brand, classic looks and lovely to ride this model in my opinion will be the next scooter success story. We will have an exclusive look at this model in the next few weeks so watch out. We're more used to seeing our rock stars being ferried about town in blacked out limousines so it comes as quite a surprise when we discover an A-lister hiding under a helmet. Earlier in the week it was Brad Pitt we spotted leathered up and roaring around New Orleans on his new motorbike. This week though, it was the turn of Canadian rock legend Bryan Adams to turn to two wheels. His choice of transport - a 125cc Piaggio Fly - was slightly less hell-raising than Pitt's custom-built Swift machine - but just as nippy about town. 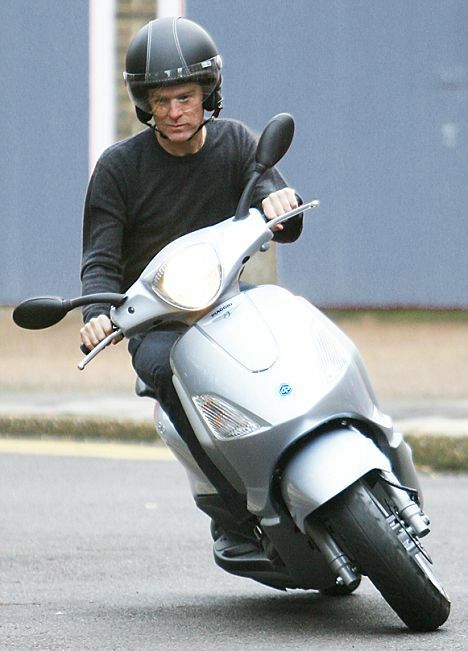 The hit singer hopped onto his trusty £1,860 Piaggio scooter to speed around the streets of London this week. And while it might not have the bhp of Brad's machine, any scooter devotee will tell you that a scooter will take you across town in a fraction of the time of a burly bike. Judging by the knee-grazing angle he took the corner, Adams is an experienced rider, despite that fact that he has a colourful scooting history. Back in 2002 the crooner was papped whizzing about town on his Piaggio with Gwyneth Paltrow sitting on the back, clinging on for dear life. 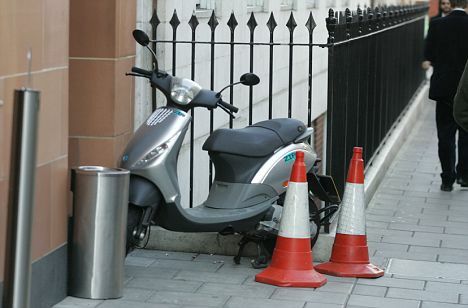 Then, in 2007, photographers nabbed Adams illegally parking his Piaggio Zip on the pavement outside Cipriani restaurant in Mayfair, London. This time round though, despite the extreme lean, Bryan appeared to be sticking to the rules of the road. Adams is not the first multi-millionaire star to swop the comfort of a car for a more robust ride. 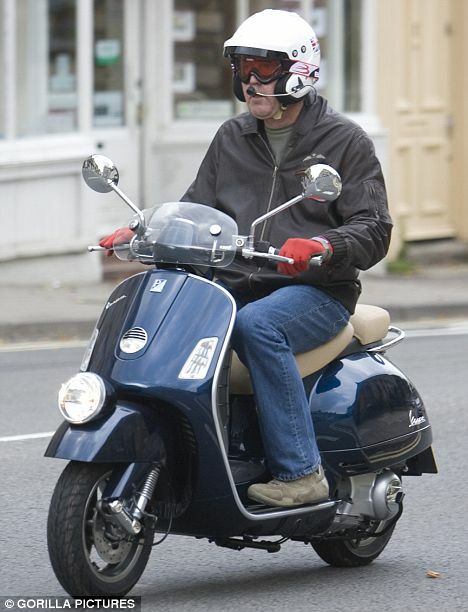 Other scooter fans include the Gallagher brothers, Chris Evans, and, most shockingly of all, Jeremy Clarkson, who despite having called scooter riders all the names under the sun, recently managed to cram his pudgy head into a helmet and beat traffic on a Vespa GTV. Motor Journalist Pits Honda Scooter Against V8. Motor journalist David Dowsey recently exchanged his V8 car for a Honda SH150i scooter for a one month commuting trial around the streets of Melbourne, and found it difficult to switch back. As the editor of 'Australian Automotive Workshop' magazine, published by the Victorian Automobile Chamber of Commerce (VACC), David is passionate about cars. "I'm a big fan of V8 performance cars and never gave scooters much thought," said Mr Dowsey. 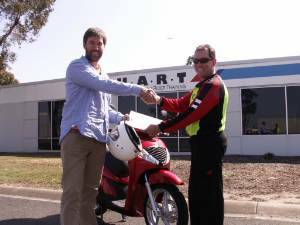 That was until he got his learner permit from Honda Australia Rider Training (HART), and found himself considering two wheels over four. "What amazed me about the HART experience was how confidently and quickly my group of fellow learners were up and riding. Almost none of us had any two-wheel experience and yet we were changing gears, indicating and emergency-stopping within no time." "The instructors were first class. I wanted people who were encouraging, but honest with me; the crew gave me what I was expecting and more." "The open road is an intimidating place for a beginning rider to develop their skills, so I really appreciated the safe and non-threatening environment of HART." After a month of commuting on the Honda SH150i, David was a convert. "I live in the city so driving a big car through peak hour traffic just doesn't make sense. Riding a scooter to work cut my commute in half. And need I mention the money I saved on petrol!" "After the HART rider training and spending some time on a scooter I'm going to find it hard to justify my former ways." "Not only would I now recommend scooters to my friends, I am going to put my money where my mouth is and am going to go and buy one for myself." David Dowsey is editor of VACC's Australian Automotive Workshop and is a regular contributor to Unique Cars and Australian Classic Car magazines. Arqin offers up to $1000 cashback this summer. Arqin Motorcycles has a cashback offer to put more cash in your pocket over summer. Purchase an Arqin V3 250 with a RRP of $5490 +orc and receive $1000 cash back or purchase an Arqin Sprint 125 cc scooter with a normal recommenced retail of $2090 + orc and receive $300 cash back. This means you will pay only $4490 + orc for the V3 250 or only $1790 + orc for the Sprint 125. Offers are on now till the end of summer and available nationwide from your local Arqin stockist. If your in Sydney why not check out the new Arqin Dealer, Racecourse Motors in Randwick. See Alan and the team who have been operating the family owned business for over 20 years. You can find Racecourse Motors at 16 Alison Road Randwick (Opp Randwick Racecourse) or give him a call on (02) 9314 7700. Vespa launch the GTV 250 i.e. Sidecar as a prototype at this years recent Eicma show in Milan. 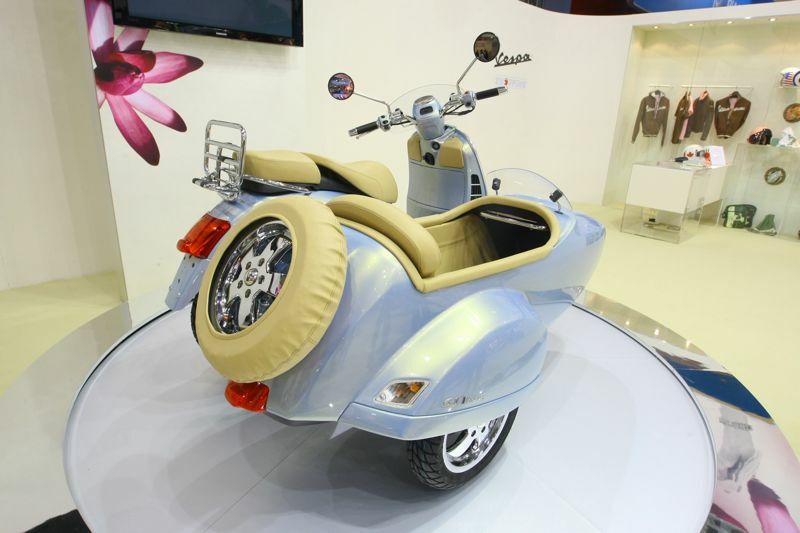 The romantic taste of travel returns to live in concept as the Vespa Sidecar. Vespa introduced the GTV Sidecar, a prototype that evokes the atmosphere of when the first sidecar was launched over 50 years ago. The first sidecar in fact launched in 1948, coupled to a Vespa 125. Over 50 years since, the sidecar still finds itself as a form of transport that is both practical and affordable. The Vespa GTV Sidecar returns to live again in this prototype with the pleasure of experiencing travel in a sidecar along with the image of being on a vintage scooter. 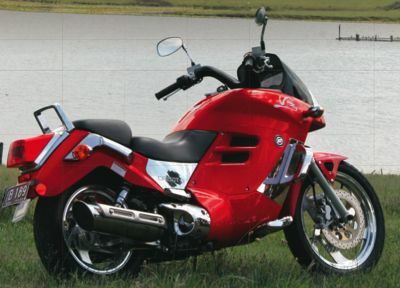 The GTV 250 ie has a 250cc 4 stroke, 4 valve, water cooled, electronic injection motor along with discs on both wheels. The Vespa GTV represents the vintage spirit of a brand that is known as the icon of Italian style around the world. 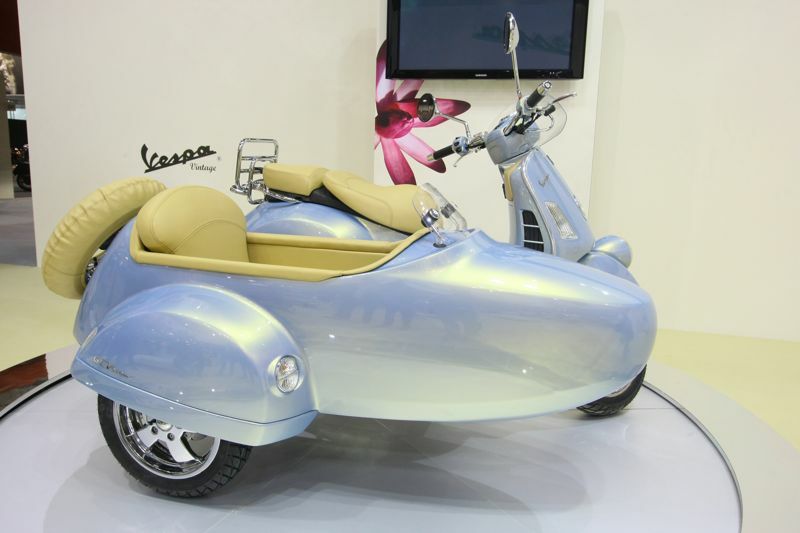 Though this Vespa Sidecar prototype takes advantage of the technology that characterises Vespa in the 21st century.